The sample player component provides a powerful way to control audio samples in Unity even further. It makes it possible to control the gain of each channel in a multichannel audio file independently. 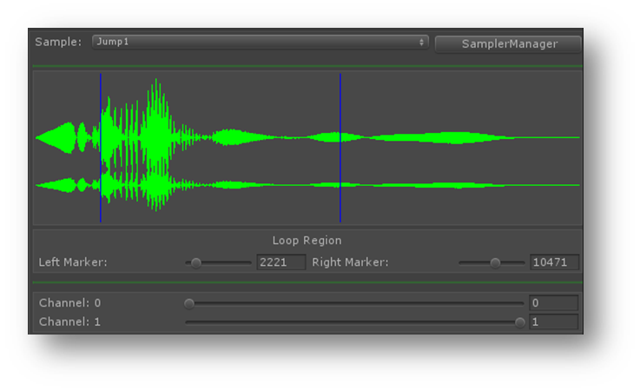 It also makes it possible to read loop region markers from a wavfile or to set them manually from the inspector UI. Allows to set left and right markers to define a loop region. The region will be automatically set if the audio clip is a wavfile that contains markers in its meta data. Controls the gain (0-1) of a channel. Note: Currently Unity supports up to 8 channels.